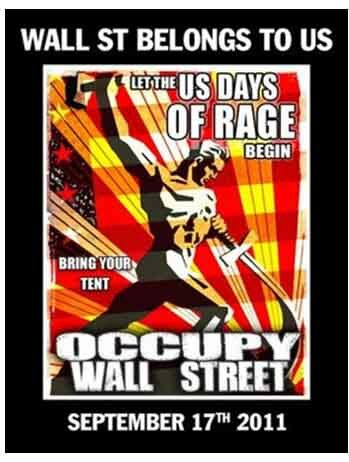 Occupy Wall Street Protests / Who Is Behind Them? Who’s behind the Wall Street protests? NEW YORK (Reuters) – Anti-Wall Street protesters say the rich are getting richer while average Americans suffer, but the group that started it all may have benefited indirectly from the largesse of one of the world’s richest men. “I can understand their sentiment,” Soros told reporters last week at the United Nations about the Occupy Wall Street demonstrations, which are expected to spur solidarity marches globally on Saturday. Soros, 81, is No. 7 on the Forbes 400 list with a fortune of $22 billion (14 billion pounds), which has ballooned in recent years as he deftly responded to financial market turmoil. He has pledged to give away all his wealth, half of it while he earns it and the rest when he dies. He urged the Obama administration to take bolder action, either by recapitalizing or nationalizing the banks and forcing them to lend at attractive rates. His advice went unheeded. The Hungarian-American was an early supporter of the 2008 election campaign of Barack Obama, who will seek a second term as president in the November, 2012, election. He has long backed liberal causes – the Open Society Institute, the foreign policy think tank Council on Foreign Relations and Human Rights Watch. The Vancouver-based group, which publishes a magazine and runs such campaigns as “Digital Detox Week” and “Buy Nothing Day,” says it wants to “change the way corporations wield power” and its goal is “to topple existing power structures. The protests began in earnest on September 17, triggered by an Adbusters campaign featuring a provocative poster showing a ballerina dancing atop the famous bronze bull in New York’s financial district as a crowd of protesters wearing gas masks approach behind her. Dressed in anarchist black, the battle-ready mob is shrouded in a fog suggestive of tear gas or fires burning. Some are wearing gas masks, others wielding sticks. The poster’s message seems to be a heady combination of sexuality, violence, excitement and adventure. Former carpenter Robert Daros, 23, saw that poster in a cafe in Fort Lauderdale, Florida. Having lost his work as a carpenter after Florida’s speculative construction boom collapsed in a heap of sub-prime mortgage foreclosures, he quit his job as a bartender and travelled to New York City with just a sleeping bag and the hope of joining the protest movement. Daros was one of the first people to arrive on Wall Street for the so-called occupation on September 17, when protesters marched and tried to camp on Wall Street only to be driven off by police to Zuccotti Park – two acres of concrete without a blade of grass near the rising One World Trade Center. “When I was a carpenter, I lost my job because the financier of my project was arrested for corporate fraud,” said Daros, who was wearing a red arm band to show he was helping out in the medic section of the Occupy Wall Street camp. Adbusters’ co-founder Lasn dismisses that, reeling off specific demands: a tax on the richest 1 percent, a tax on currency trades and a tax on all financial transactions. On 60 Minutes, George Soros let it be known he felt no remorse for aiding the Nazis when he was 14 years old. His life has been full of demonic vileness! He is a powerful promoter of criminal activities. He is referred to as the owner of the Democratic Party.